The 2013 EuroCup Women final is to be contested between the number 9 seeds Kayseri Kaskispor from Turkey and 10th seed Dynamo Moscow from Russia. Both teams were perfect in their semi-final series against MBK Ruzomberok and BC Vologda-Chevakata respectively. In the all Russian affair between Dynamo Moscow and BC Vologda-Chevakata it was not until the final quarter that the 2007 EuroCup Women Champions made the decisive break to secure the series win. BC Vologda-Chevakata, trailing by 9 points after game one, went into the final quarter leading (50-43) and trailing the series by just 2 points. However they imploded and lost the final quarter (6-21). Just like last season, they failed twice against their Russian opponent during the semi-final play-off stage. For Dynamo Moscow Kristi Toliver with a game high 28 points was the player on form. She had 9 points during the final-quarter run by her team. Dynamo Moscow won the game (68-62) and the series (150-135). In the second semi-final Kayseri Kaskispor already had a 19-point lead from game one. So the chances of road specialists MBK Ruzomberok making up the deficit were slim. All the same the first 20 minutes were lively with MKB holding a 1-point lead at the break (36-35). After the first half Kayseri Kaskispor put together a 21-7 run which put the game and the series out of reach for MBK Ruzomberok (56-43) with 15 minutes to play. 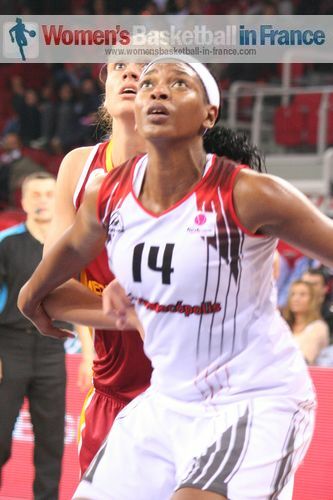 Asjha Jones (in picture) and Evina Maltsi led Kayseri Kaskispor with 18 points apiece as they ended MKB's unbeaten away record in this competition (73-65). Kayseri won the series (152-125) and as higher seeds have home court advantage for game 2 of the final. The final two games of this year's competition will be played on 7 and 14 March 2013.